The circus has come to town! An experience not known for a hundred years with a “rock concert” feel to it, according to an organizer interviewed by CBC this Friday morning (October 6th). Lights, glitz, glamour, press the button and let the sideshow begin. For anyone hoping to see clowns at this circus, you won’t be disappointed. It’s all pretty sad. 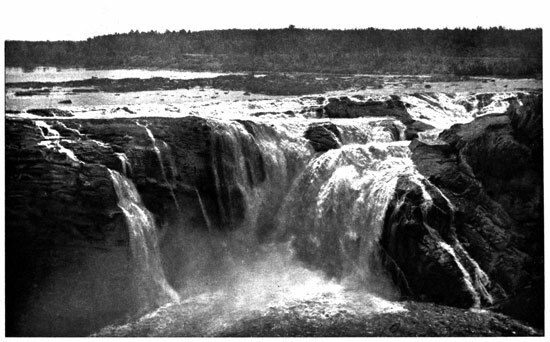 Akikodjiwan before the dam. Our sacred falls do not need lights and glitz. They need to be set free. As an Algonquin, I am greatly troubled by the spectacle taking place now at Akikodjiwan. The people who planned this outrage dare to tell us that what is occurring now at our ancient sacred space is in complete respect of Indigenous spirituality. I, for one, am truly sickened by what is taking place. I ask that all people who go to the dam at Chaudière Falls ask themselves why should such a profoundly beautiful and spiritual place like Akikodjiwan be turned over to a developer? And with that, be forever lost as greenspace, as a park and as a sacred site for the benefit of the generations now and tomorrow. How foolish and spiritually lost we will prove ourselves to be as a society if we do not defend Akikodjiwan. Let’s use the freak show taking place at Chaudière Falls to our advantage. A golden opportunity to educate the public has landed at our feet. The faith leaders and the citizens of this region who understand the power of spirituality should visit the falls now with an open mind, a pulsing spirit and a heart ready for Creator’s touch. Let all who go there feel the energy and might of Akikodjiwan. Let the sacred waters of Creator’s gift reach into their souls. Let the whispers emerging from the rapids urge them onward to join the fight to save Akikodjiwan. At this desperate time of chaos and wanton hopelessness, our world needs this sacred site. Please sign House of Commons e-petition #1153. Tell the Government of Canada to stop any proposed development at Akikodjiwan. This entry was posted in Community, Spirituality and tagged Akikodjiwan, Albert Island, Algonquin, Anishinabe, Asinabka, CBC, Chaudière Falls, Chaudière Island, condos, DreamCorp, faith, Faith Is Peace, Great River, Hydro Ottawa, Justin Trudeau, Kichi Sipi, Lebreton Flats, OMB, Ottawa, Ottawa River, Petition, Reconciliation, sacred land, sacred waters, spirituality, unceded, UNDRIP, Victoria Island, Windmill Development Group, Zibi. Bookmark the permalink. I too heard the interview. We must forgive Guy Laflamme — his tendency to dazzle is unstoppable; remember, when he was working for the NCC, how he thought he could get away with a photoshopped view of Parliament Hill? He’s been Flim-flam Laflamme for me ever since. He’s the one responsible, along with Mayor Watson, for having turned “Canada 150″ into a year-long party, with nothing to show for that lasts — a real embarrasment and shame. The Algonquin representative is another matter. She clearly means well, but the fact that the whole thing hinges on just this one Algonquin FN was never brought up. As you say, thousands will flock to this event. An excellent opportunity to educate. Can we not have a constant presence there, handing out an information sheet, inviting people to sign the petition, etc.? I’d be prepared to do a shift. Miigwetch South Wind. Please know that I really value your presence and words. It is so sad that light is being used to blind people of the truth. My thoughts and prayers are with you, your family, and your helper. A travesty…Thanks for this writing. Once again, I applaud the courage, integrity, and honesty of Albert Dumont for standing up to continually speak about what is True and Right for the benefit of all Living Beings on the Earth Mother. Kitchi miigwech,, Albert! It’s good to have this article to send on to others who are asking questions. From the centre of my circle, I say a heartfelt ‘Kichi Migwech’ to all of you who stand with us in condemning the use of our sacred Akikodjiwan as a circus sideshow. Such disrespect of spirituality and sacredness would never be tolerated at any of the mainstream places of worship! Why is such outrageous nonsense allowed at our place of healing and spiritual re-invigoration? We are being told that the light show at Akikodjiwan should be acceptable to all because “Reconciliation is a two-way street”. No one understands the concept of reconciliation more than do the people who wish to protect what is sacred to them. What is going on now at Akikodjiwan has nothing to do with a two-way street. If you support the developers and the politicians who would destroy a sacred place, then you are brought in as a consultant. If you do not agree with their plans, you are either totally ignored or even ridiculed. It’s like being invited to what is being billed as a ‘community feast’. When you arrive, you discover that the foods being prepared are being cooked to satisfy only the tastes of a small segment of the community and told “If you can’t or won’t eat it, then you can lump it.” Call it what you will but this is not reconciliation. Our spiritual beliefs are under attack and we, who would defend them, are being mocked in the most despicable way. I call on the faith leaders of the Ottawa region to stand with us in condemning the sideshow at Chaudière Falls. Please do what is right. Agree with Jane and Erwin. I too would be willing to be there to hand out info and have petition. Thank you, Albert. This sacred site is certainly needed now. I think the idea of providing information at the site is a good one. We should have something that shows the free falls and describes their importance to the people here before the Europeans…and mention the freethefalls website. I could hand out information. Your spiritual leadership, insight and wisdom is so much needed by the world we live in and the culture that is so disconnected from our higher spiritual natures. Let us sing, and drum and listen this coming Saturday, Oct. 14 to Spirit to Love that calls us now to gather. At the Peace Tree on Asinabca Island known as Victoria.. in the storms of life in the darkness we can lose our way but with leaders such as your self holding space for us to meet on your sacred places of your ancestors worship space we the One’s who are awake will hear you call to walk in solidarity and in so doing in faith experience peace. That a better healthier world is unfolding as we see this and that and make a choice. To travel the path less traveled more people are awakening it is in this sound and light display we can better see ourselves. And say enough to glitter and pomp and high noise that has no substance.. in nature only can we find our true spiritual selves and the mental clarity we need to see. We are the One’s who must change and in so doing healing is us our energy of love transforming our world for the Falls and ourselves and the imprisoned Algonquin Ottawa River Watershed to be freed.. is a vision that affects our collective destiny as a species. Deep Meegwetch Elder Albert and let us bless all who are awakening to see the truth that is setting us all free! I feel sick. I cannot believe this precious site can go down in so tawdry a way. I believed that this would never, could never happen. After Grandfather William Commanda died I felt sure I could keep the site safe for him. The time was ripe. How stupid I was. All I can do now, it seems, is write this as I’m weeping. Tell me what to do. If there will be a stand on the ground in front of bulldozers I will be there. I have to keep doing something. I don’t know what. I need advice from elders. Akikodjwan- if it can’t be safe how can anything be safe? As Akikodjwan, so the planet.